The excavations at the Kom el-Nana monastery complex produced large amounts of pottery, an important source of information on daily life at the monastery. This included Egyptian Amphorae (i.e. 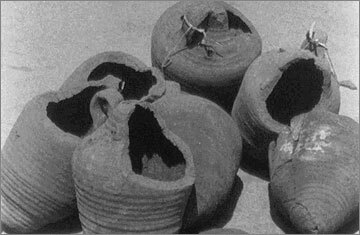 large storage vessels), which made up over 43% of the assemblage and originally contained wine, oil or vinegar. The wine was used for drinking in ritual and domestic use; the oil for cooking and lighting and the vinegar for pickling to preserve foodstuffs for the winter months. 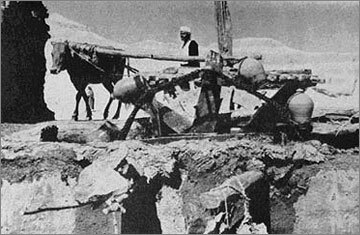 Water pots for attaching to water wheels (in a form in use until quite recently in Egypt) were found in large quantities as were the many table, kitchen and storage vessels in everyday use. These included bowls, basins, jars, dishes, lids, cooking pots, colanders, cups, goblets, flagons and jugs. Other pottery may well have had a specialised use such as braziers for burning incense, flasks for precious oil or unguent and a strange vessel for which no use has yet been suggested other than cheese making. 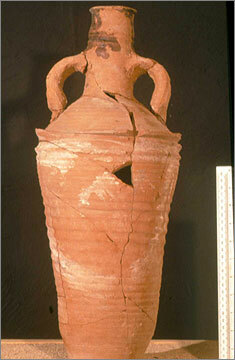 An amphora, made in Egypt, from the monastery at Kom el-Nana (catalogue no. 444). Traces of pitch or resin are present on the rim and neck. Broad ‘swags’ have been added in cream paint. 5th or 6th century AD. Water wheel (sakkieh) in use. Note the pottery vessels used to scoop up the water lashed to the perimeter of the wheel. 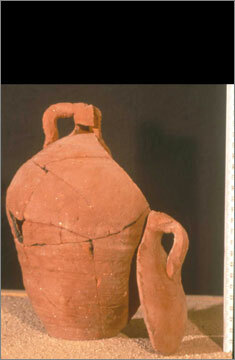 Similar vessels were found at Kom el-Nana. The bulk of the pottery was made in Egypt except for small amounts of fine table wares from Tunisia (perhaps used at the Abbot's table), and a few amphorae from North Africa, the Eastern Mediterranean and Palestine. The painted decoration on many vessels was intricate and varied and mirrored that found elsewhere in Egypt during the Late Roman Period such as at El Ashmumein, a town in Middle Egypt; Gurna and Elephantine, both towns in Upper Egypt; Esna, a monastery in Upper Egypt and Kellia, a monastery in Lower Egypt. However, Kom el-Nana has a unique jar which contains panels depicting many faces, fish and standing figures. 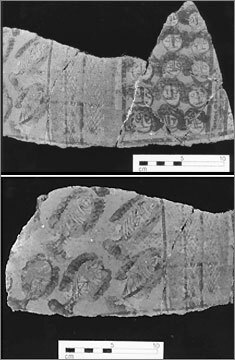 Group of sherds from a painted jar from the monastery at Kom el-Nana (catalogue 277/8) depicting faces and a fish (a Christian symbol). 6th century AD. One of a group of nine similar pottery vessels from the monastery at Kom el-Nana (catalogue no. 424) in which a panel from the shoulder, with its own handle, has been separately made. All examples have a hole in the base and some have holes pierced on the shoulder. The purpose of these vessels is not known. 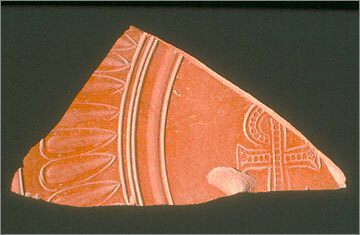 An African Red-slip Ware sherd from the monastery at Kom el-Nana, decorated with the Christian Chi-rho symbol. 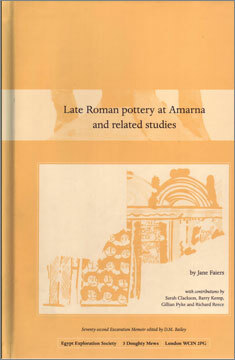 The processing of the pottery was completed in 2003, and in 2005 the first volume of the corpus was published. A second volume, entitled 'Late Roman glassware and pottery at Amarna and related studies’, is currently in preparation. Faiers, J., with contributions by S. Clackson, B. Kemp, G. Pyke and R. Reece. 2005. Late Roman Pottery at Amarna and Related Studies, Seventy-second EES Excavation Memoir, London: Egypt Exploration Society.